My summer reading list included catching up on some industry news, trends and best practices. It got me thinking about bylined articles. A number of GovCon media outlets publish contributed content from leaders in the industry. Writing a 600-word educational (not promotional) article or blog takes a bit of effort, but it’s worth it! In fact, it’s a win-win arrangement that inserts a fresh perspective into the publication and strengthens the author’s credibility. I’m always delighted when clients’ articles are accepted and published. And I’m always disappointed when clients miss easy opportunities to promote them. Great thought leadership content typically has a long shelf life. When your article is published, you’ll want to promote it right away – and for weeks, even months, to come. 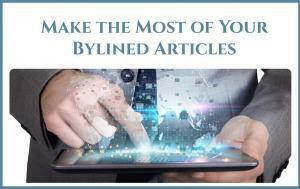 Here are six ways to make the most of your bylined articles! Post a link to the article on your website. A link is an easy add to the News section of your website, promoting your thought leadership and reinforcing your company’s SEO. Include an introduction to the article and add a graphic next to the link, to make the article more inviting. PRO TIP: Check with the publication about reprints. Downloadable digital reprints can complement your website link. Printed reprints can be impressive in your press kits or as handouts at industry events. Create social media posts that link back to the article. Most companies remember to use social media when an article is published. Be sure to go beyond just stating the obvious (“Our vice president wrote this article on…”) and include a hook from the content (“Now is the time to figure out #DevOps for…”). Use hashtags, where appropriate, to help people find the relevant article. PRO TIP: Schedule a few posts right away as well as some #ICYMI posts for a few weeks from now, for those who miss it the first time. Like, comment on and share posts from the publication. Most media outlets use social media to share content they publish. When you see their posts, engage! Ask your marketing team to do the same with company social accounts. Encourage business development personnel and others to engage, as well, to reach their social followers who may be interested in the article topic. PRO TIP: Follow the publication on social media. It’s another win-win, as the media outlet gets more followers, you get added visibility into their content and readers. Publish on LinkedIn. Though the publication owns the copyright, you can still use the LinkedIn publishing platform to write a short opinion piece that refers back to the article. PRO TIP: Reach out to key personnel, customers and partners and encourage them to comment on your LinkedIn article. A genuine comment can help to spark further interest in the topic. Include a link in your next blog. When you’re working on a byline, coordinate the effort across all content marketing for the company. Plan a blog on a related topic that links back to the original article, strengthening both pieces of content. PRO TIP: If you do podcasts, include a link in the description of a related podcast. Your well-written, well-placed bylined article can be a tremendous asset, effectively inserting your voice into an industry conversation that’s important to you, your company and your customers. If you’d like advice or assistance on your bylined articles or thought leadership program, please let us know. Our team is always ready to support you!